Emerson’s Douglas Morris, a member of the alternative energy industry team, opens his 2013 guest-blogging season with a look at what’s in store for the alternative fuels industry this year, here in the U.S. Happy New Year. For me, the New Year is a time for reflection and renewal and in that light I’d like to reflect upon the alternative fuels market in the United States and what may be in store for its future…it’s certainly been a trying last couple of years for the industry and both challenges and opportunities lie ahead. When the industry started in earnest with the passing of the Renewable Fuels Standard in 2007, there were a few key tenets which alternative fuels were geared toward solving. Atop this list was the goal to reduce the country’s dependence on foreign oil. As it turns out, 2007 was the peak for US oil imports and the use of liquid fuels has been declining ever since. A recent Financial Times article discussed how US oil imports will soon fall to their lowest level in 25 years. It’s the combination of declining fuel use and increasing production from the likes of tight oil that are closing the demand gap. Another goal for alternatives was to reduce the production of greenhouse gas (GHG) emissions, which for the US transportation sector represents about 27 percent of the emissions for the entire US economy. The reduced use of transportation fuels has lowered vehicle emission. A bigger contributor to lower carbon emissions, though, is the effect of plentiful natural gas from shale, which is changing the mix of fuels used for commercial power from coal to gas. 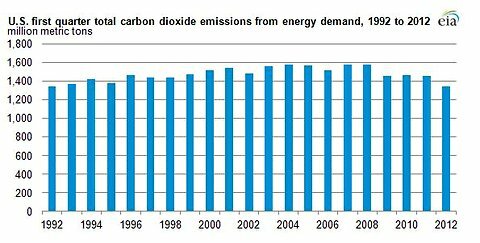 The following chart shows that last year’s first quarter carbon data was equivalent to 1992. Note the peak around 2007. I have to be fair to the industry, though, because no one could have foreseen the effects of shale gas so many fronts. Things, unfortunately, just haven’t panned out as originally planned. It’s not time to give up. Despite the negatives, there are two organizations working in the industry’s favor…the US government and the US Military. As far as policy is concerned, there are incentives kept in place, even with the budget battle in Washington DC. At least for the next year, the cellulosic biofuels production credit and the accelerated depreciation for cellulosic plants are still in effect, along with the renewable diesel tax credit and alternative fuels excise tax credit. This biggest future driver for alternative fuels, though, may be the military, which still has a goal of developing a renewable replacement for oil-derived fuels. Time will tell how successful this strategy becomes, but for this industry, the military remains its most vocal supporter. Posted Friday, January 11th, 2013 under Energy.